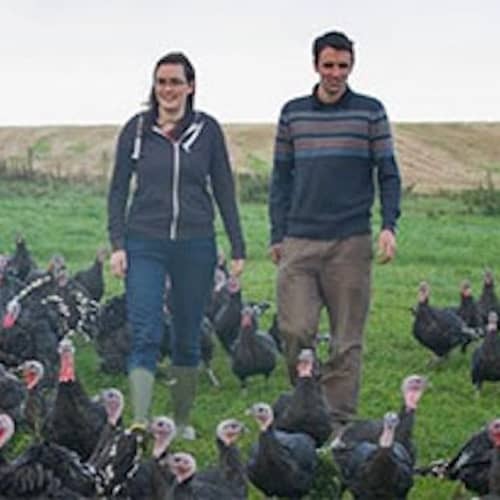 The Walters family have been rearing turkeys at Scobbiscombe Farm since 2000. We pride ourselves on producing the finest quality Free-Range Christmas turkeys under the highest welfare conditions. We grow turkeys which have been specially bred to grow slowly and produce the best tasting Christmas dinner. Following great feedback last year we are rearing more of the ‘TINY’ breed of turkey. This means that we can supply a smaller turkey without compromising on the importance of rearing to full maturity. We are also offering a DELIVERY service throughout Devon allowing you to arrange the centrepiece of your Christmas meal from the comfort of your own home. As a small producer of Christmas poultry, we are able to provide them with a high standard of living conditions and give them all careful attention. We are members of the Traditional Farmfresh Turkey Association. This provides assurance of the highest quality turkey and we are inspected annually to ensure that we meet high standards in welfare, traditional methods and hygiene. Please follow the link to see cooking instructions and recipe ideas alongside further information about the association.